A satirical billboard from last year’s counter campaign. The campaign will target the anti-immigration advertisements of the government plastered around the country on billboards and in newspapers, TV and radio ads. According to the satirical party, Hungary has never been so full of hate. “We would like to do something in order not to have such a terrible mood in the country,” the party said. This is not the first time the Hungarian Two-tailed Dog Party has launched a counter campaign. Last June they teamed up with Hungarian blog Vastagbőr (Thick skin) to increase public awareness about the government’s controversial position on immigration. In just a few days, HUF 15 million ($54,500) was contributed by supporters. 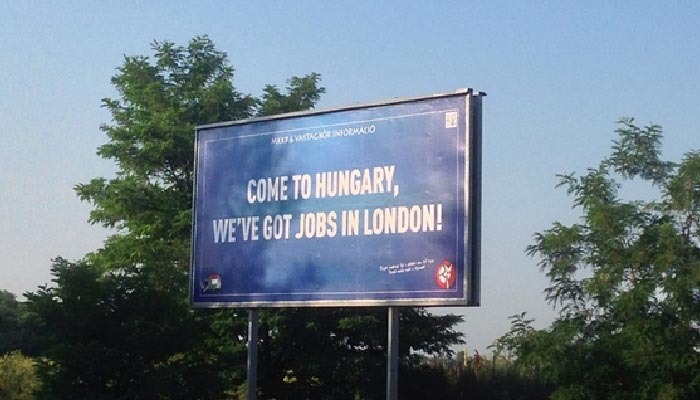 The money was used to post billboards with satirical messages, ridiculing the original advertisements, all over the country, reaching even the village of Felcsút, home to Prime Minister Viktor Orbán.